Pro at music or merely an enthusiast, the fact remains that attending live gigs is an exciting way to spend an evening. Given you, of course, will have genre preferences, there are all kinds of bands and artists ready to bring their amazing work to the stage, so you can have a gala time up and close with lovely musicians, some of them being your ultimate favourites. With indie and homegrown musicians on the rise, there are multiple venues in the city that host live gigs. But here are some of our favourite venues, and once we tell you why, we’re pretty sure you’ll agree with us. The Finch’s primary attraction, in Powai, is their stage, which is positioned tactfully to offer an equally nice view from anywhere in the seating area. Why we love this place for live gigs is for its on-point acoustics that brings out the real sound. What’s even better is that they offer their stage to bands, budding and renowned, and solo artists across genres. Click here to know more about The Finch. The Stables is a part of the Peninsula Redpine – a hotel situated right opposite the Marol Naka metro station. With its wooden décor and cosy feel, this place is perfect for singing along and shaking a leg to the tunes of your favourite bands. What’s even better is that they treat their performing musicians well. Not restricted to genres, follow their pages for updates so you never miss out. Click here to know more about The Stables. 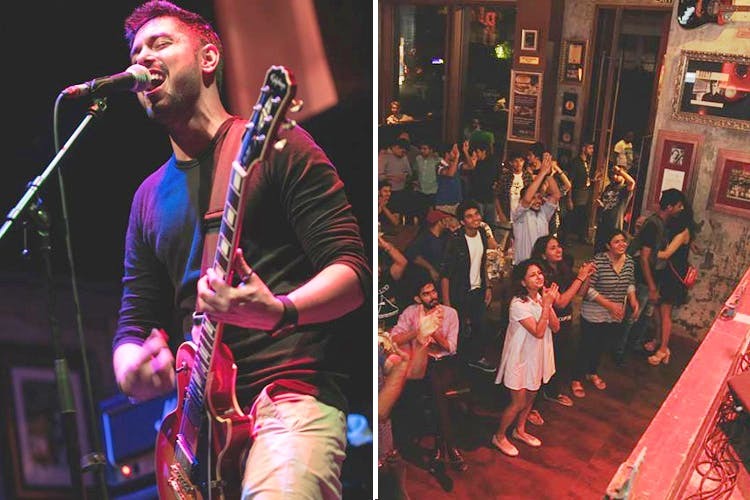 An elevated spacious stage, good crowd, choicest of drinks, and scrumptious burgers – what’s not to like about Hard Rock Cafes, especially the one in Lower Parel. We love this place for its concert feels. And because swaying in a space that is lined with memorabilia from legendary artists is just next level. While the doors of their Andheri branch are also open for performers, there is nothing that matches the feel of the one at Worli. Click here to know more about Hard Rock Café. What was earlier called Tuning Fork is now an open space called Above The Habitat in Khar. The space, that hosts musical evenings and comedy nights, changes avatars depending upon the need. The coolest part about this venue is that they have BYOB. No, we are not kidding. You can carry your own booze, and they will give you small packets of chakna with your entry stamp. They also give mixers and serve food on order. Now that’s what we call homely. Click here to know more about Above The Habitat. The latest addition to the list of coolest haunts of the city is the Flea Bazaar Café. Besides being a melting pot of all the leading food chains, and a paradise for shopaholics (they have a Propshop 24 outlet which will rightfully demand your entire bank balance), they also host artists from across genres. We love this as a venue because while you listen to your favourite musicians, you also have an option to move around and eat what you love from the plethora of available options. Plus, they definitely have the coolest artist line-up coming here. Click here to know more about Flea Bazaar Café.